Ritek USB Dongle With Extra USB Ports | OhGizmo! By David Ponce on 04/04/07 • Leave a comment! It’s a simple bit of product design, but it’s one that can make a big difference. 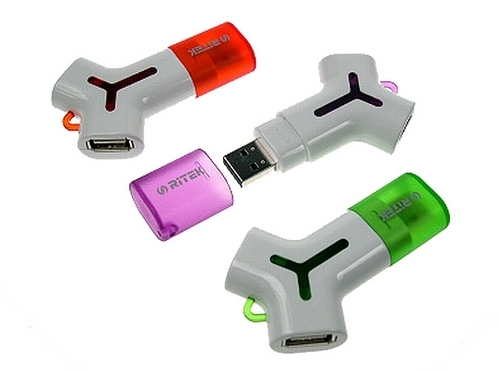 These flash drives from company Ritek are called Yego, and feature two additional USB ports. That way, when you plug these in, you don’t use up a USB port: you make an extra one! They come in sizes up to 4GB, and the tie-shaped indicator on top is used to display usage status. No word on price or availability, though they were on display at CeBit a couple weeks ago, so we’re assuming you can buy them now, somewhere.